7:15 - after R's bath I put him in his bed and gave him a kiss good night, he started to cry profusely for the next 5 minutes, and I went to comfort and sooth him for a minute after that. 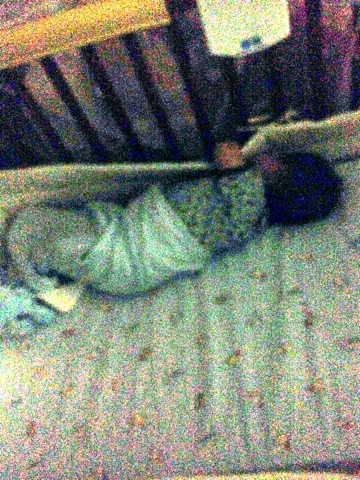 I find that every time I leave him he always cries the hardest but managed to calm himself after a few minutes and tonight was no different, he managed to fall asleep at 7:28 pm. Now what happened the next hour I cannot recall exactly the timing but basically I went to check up in my baby as I always did after he falls asleep to find him sleeping faced down, or at least what appeared to be faced down, I panicked immediately I turned him face up, this action must have startled and scared him and thus caused him to cry in an in controllable manner, I didn't know if I should hold him or not so I decided to just sooth him from the side of the bed, after about approximately 20 minutes his cries have resorted to a lazy whimper, I decided to check on him again and this time I found him in the most awkward position with his neck turned almost 90 degrees against the cot railing, and again I freaked out moving his body to a more natural position. This again caused him so much distress that this time his fries were inconsolable, no matter what I did he cried and cried. I felt so guilty!! I finally said screw it to the training, I need to hold my baby and kissed him and told him I loved him and apologized to him for waking him up, TWICE! It was close to 8:30 then and I decided to give him his last feed a little earlier since he'd probably be very worn out from the crying. 0:57: little R woke up and complained with a soft cough like cry and a few ahs. I suspect he was woken up by thr pouring rain and lightening thunders outside... Anyway at 1:02 he was back asleep again.